Please note that the content of this book primarily consists of articles available from Wikipedia or other free sources online. 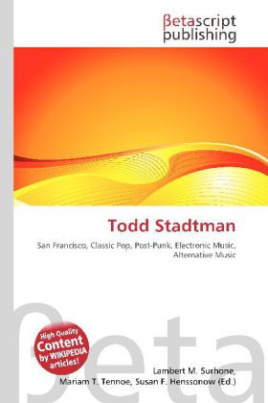 Todd Stadtman is a San Francisco based songwriter, singer and producer whose work combines an affinity for classic pop songcraft with a wide range of post-punk, electronic and alternative music influences. As a member of the duo Zikzak which also featured guitarist/arranger David Rubinstein he co-wrote, co-produced and performed on the 2000 Bitter Records album release See You There. Following that group''s dissolution in 2001, he embarked upon a solo career, releasing two solo albums in the ensuing years. The first of these, 2003''s Anxotica, featured contributions from San Francisco soundtrack artists Pray for Rain, singer-songwriter Hannah Marcus and American Music Club guitarist Vudi. For 2005''s Prix Fixe Records release Only I Can Save You a disc with a far more minimal, electro influenced sound than its predecessor Stadtman co-produced with Pray for Rain''s Dan Wool.